Hello everyone! We hope that, like us, you have spent the last week or two with family and/or friends, and that you’re having a wonderful holiday season. Now we are all faced with the eve of the new year, and as is often the case…we start to think. Typically, this gets us thinking about what we wanted to happen in the last year, what actually *did* happen and ultimately what might come to pass in the next year. Hopes, dreams, ideas, you know what I mean. For us, 2013 was overwhelming in a lot of ways. As is often the case with life, some of it was great, some was bad, some was frustrating, and sometimes we just had to shrug our shoulders and move forward. Well, I suppose we always find ourselves doing that last part. In any case, I have been bumbling about, wondering what I was going to write to you all as this year came to a close. It’s not like I think you are waiting for me to say something, but I try to keep in touch with you all on a regular basis. Lately, I’ve been more focused on other things, which brings me to this article. It’s an article that was written by Andrew French, who farms with his wife Khaiti at their farm–L.T.D. (Living The Dream) Farm–in Clayton, WI. I have never met Andrew, but I attended a workshop that Khaiti put on at a conference last year, and since then I’ve stayed in touch. In any case, I found myself scrolling through Facebook when I saw their link to this article. It talks about what we, our friends, fellow farmers, ‘food’ organizations and farm(ing) supporters in general are trying so hard to accomplish, and it’s one of the better pieces I’ve ever read on the subject. Perhaps it’s because the message–regenerate yourself–is hitting home pretty hard these days, as I try to take a step back, relax and give my body, mind and spirit the precious time they need to recover from 2013. It doesn’t matter though. Ultimately, the message here is one that we should all reflect upon no matter where we go to work or how we feel at the moment. So, yeah, the article is inspiring a lot of ideas as well, and as I sit here typing this to you now I can pretty much guarantee you that things will be changing for us in 2014. We will still be farming of course, but before we really get to any in-depth planning for the coming season, I think we need to reorient ourselves and really determine where it is that we are headed. The past four years have been an incredibly fast, rewarding and exhausting venture, and I know now that if we are going to have another four years in us, we need to do a better job of taking care of ourselves. Anyway, I already have a lot more to say about *all* of this than I want to include on this posting. My intent was to share a wonderful article, my thoughts about it and where we are and to wish you all a Happy New Year. We are looking forward to seeing you all again, and we are incredibly thankful for everything you have done to help us make our dream and the dream(s) that Andrew talks about a reality for us and for as many people as possible. As things come into focus for us for 2014, I will be sure to keep you updated along the way. As you probably know by now, I’m often fascinated by the prices I find at the local supermarkets. Why? Well, before I was farming, it was just a price. I knew it was cheap, but I had no idea how cheap it was when compared to the cost of production for a farm like ours. So nowadays I see the same prices, but I do a little mental math, compare it to an average and then wonder how this product could be SO cheap. Like much of large-scale agriculture, I find it to be fascinating, unbelievable and more often than I’d like…horrifying. $1.38 per pound! Wow. These turkeys were all around 11-12lbs, so that meant you could purchase one for around $16.00. That’s a great deal. How is it possible though? I started to think through everything required to raise a turkey on our farm, and here’s a summary of my thoughts. Before I get into that, I should note a couple of things. First, the costs I’m calculating below don’t include anything related to the infrastructure required for raising a turkey (i.e. a pen of some sort, shavings, waterers, an area for them to roam, etc). They also do not include any labor costs. I’m looking only at the basic costs of producing Thanksgiving turkeys. Two, I’m assuming approximate pricing here based on some knowledge I have personally, some research and the website for Purely Poultry, which is a company located in Fremont, WI. There are some small differences in pricing depending on which hatchery you work with, how they ship, etc. Anyway, there are a few major stages to raising a turkey. In our first year, we raised 50 turkeys, so I’ll run with that number and pretend that I’m just an average person looking to raise turkeys for myself, my family and friends. Any left over will be eaten by the same people or sold to others by word-of-mouth. By raising this many, I’ll be able to benefit from some small price breaks. Raising only five, for instance, would be a little more expensive. If I raised conventional, broad-breasted white turkeys, they would cost $6.24 each plus shipping. Shipping would be $20 regardless of which type you purchased. If you wanted broad-breasted bronze turkeys, the price goes up to $6.37 each (+$20). If you wanted heritage turkeys, the price goes up again to $9.60 each (+$20). If I used our current brooder box, it requires one 250 watt bulb to create a 4′ x 4′ area that has a temperature of 100-105F. 105F is a little high, but the birds can moderate their own temperature by leaving the area for a bit and coming back. Anyway, all I need is that one bulb for my 50 turkeys. If I run that bulb for 24 hours a day for a couple of weeks, the cost would be somewhere around $8.00. 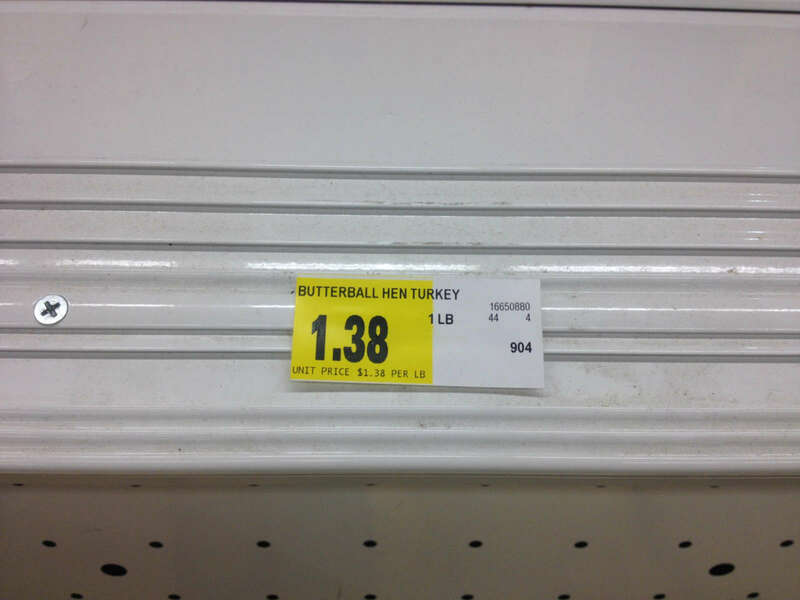 If I divide that into each turkey, it costs $.16 per bird. Not too bad. Feeding turkeys will be one of the most expensive stages because they are bigger birds, you raise them longer than most birds and the conventional variety grows pretty quickly–so they eat quickly too. If we assume that a conventional, broad-breasted turkey will take 4-5 months to raise, we’re looking at around 75lbs of feed or ~1/2lb of feed per day on average. A heritage turkey takes 6-7 months–or longer–so we’re looking at around 125lbs of feed for them. You can lower this a bit by putting them on pasture, but there will also be times that they’re going through a growth spurt, and they’ll eat a lot more. The cost of feed can vary a lot too, depending on how you do it, but I’ll assume $.25/lb for feed. Organic can cost a lot more, higher protein gamebird starter–you start them on this for a couple of weeks to a month–also costs more, but $.25 is our ballpark figure for this exercise. Processing can vary too, but in general it will cost $7-$9 for a non-huge turkey. If we divide that into a 12lb conventional turkey, that’s $2.71/lb, and it’s $4.03/lb for a heritage turkey. This is the basic cost of production and break-even price. Then I look back at $1.38/lb. Again, I haven’t included any infrastructure, transportation or labor costs in these figures. If we did this, the price per pound should go up for both a conventional and a heritage turkey. Our farm charges $4/lb for a conventional turkey and $5 for a heritage turkey. So, if our farm sold these birds, we would sell that 12lb turkey for $48 or $60. If my cost of production is $32.55 and $48.41 respectively, then the money we make beyond the cost of production is $15.45 for each conventional turkey and $11.59 for each heritage. Just for fun, let’s add some of those costs of production. It’s 30 miles to our processor, one-way. So that’s 60 miles I have to drive to get them to the processor and come home. It’s 10 miles to the feed mill, and if I only go there once in 4 months, that’s 20 miles for a round trip (the odds of one trip are VERY low). So 50 miles in a truck that gets 25 miles per gallon is 2 gallons of fuel. Over the course of the 4 months, we’ll use another 5 gallons (at least) with our ATV, which we use to haul feed, supplies, etc. out to pasture. So, 7 gallons and I’ll assume that people come pick their birds up. Right now, gas is $3.20/gal, so let’s subtract $22.40 from our previous earnings. Now we have $750.10. If I only use bagged wood shavings, I’ll want 6 bags for the time that the turkeys are in the brooding area. So, that’s another $30. Now we have $720.10. This is not accurate, by any means, but let’s project “the farm” out long enough that the equipment, land, buildings, etc. needed to raise them and future birds would cost $.50 per bird. Now we have $695.10. If someone spends 30 minutes per day with these turkeys on average, that ends up being 60 hours if we keep them for 120 days. Let’s pay that farmer minimum wage for his or her work, so $7.25 per hour. That’s $435 dollars. 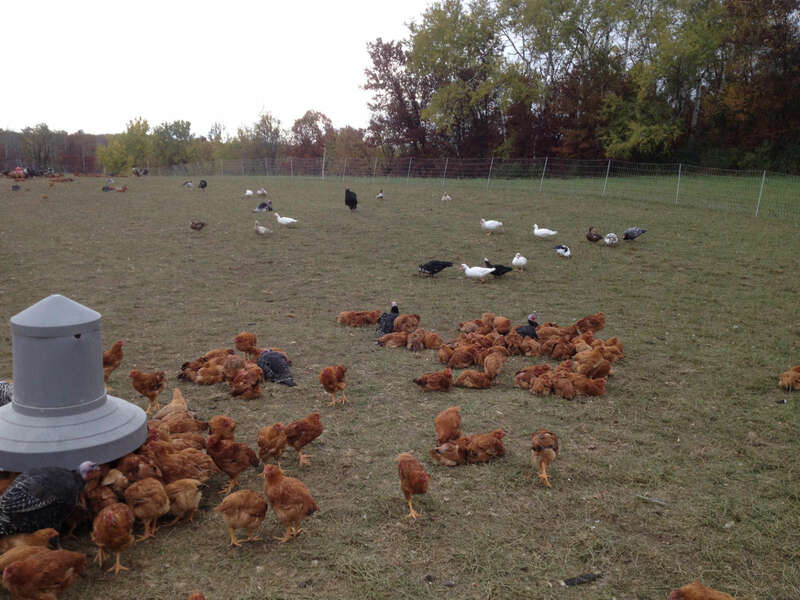 Now the farm has $260.10 left, or $5.20 per bird in net profit. It’s really important to take a second here and point out that a lot of farmers do not pay themselves for their labor. Instead, the net profit all goes into the farm. While I realize that the farm is ‘ours’, it is a separate legal entity and it is a business. Most businesses need to pay employees to succeed, and in the case of a farm, it’s usually the farmers who are the employees. So, if you never pay yourself anything for your labor, your numbers can look better here. Granted, it’s only the numbers that look good and you are subsidizing them with your life. We are paying our farmers in this exercise though! If the farm sells one turkey for $48, and it then gets to keep $5.20 of that after the costs of production…..that’s a profit margin of just under 11%. In my book, that’s not as good as it should be for a living wage, successful farm, etc. Still, what’s a good profit margin? If we say that 20% is a profit margin we want, then I need to make $9.60 per bird. The difference from the $5.20 I was making is $4.40 and that divided into 12 pounds is $.37 more per pound that I need to charge. So, I should be charging around $4.37/lb to be in an ok situation. That means your turkey now costs $52.44 instead of $48.00. I don’t want to belabor the point here, but this also assumes that we start with 50 turkeys and end with 50 turkeys. The odds of this happening are relatively slim, and the ‘expected’ losses tend to be in the 2-4% range. So we’ll expect to lose 2 birds. Predators, the weather and random acts of death being what they are, we’ll most likely lose at least 4-5 birds. Those birds will die at different stages, so the losses will vary for each one. Having said that, we won’t spend as much on them either because they’ll be gone. Losses early on are far more, um, affordable let’s say, than losses toward the end when you have all of this time, energy and feed wrapped up in each bird. I want to make sure we include this in the thought process, but I won’t include them in the overall calculations for this exercise. Anyway, a 10.9% profit margin for the farm isn’t great, and in that scenario I had to spend all of that money in order to make my $5.20 per turkey ($260)—and we still haven’t included *all* of the costs of production here. Apologies for the slight delay here, but the grain bin has been up for a week now. This is a CMC (Custom Marketing Company) bin that is often referred to as an “18 by 5” because it is 18 feet wide and made up of 5 rings. It is between 20-30 feet tall, so that puts it just underneath the roof of the pole barn it’s next to. Why CMC? Well, for one, they have a patented “Pressure Cure” system that only uses air to dry the corn. 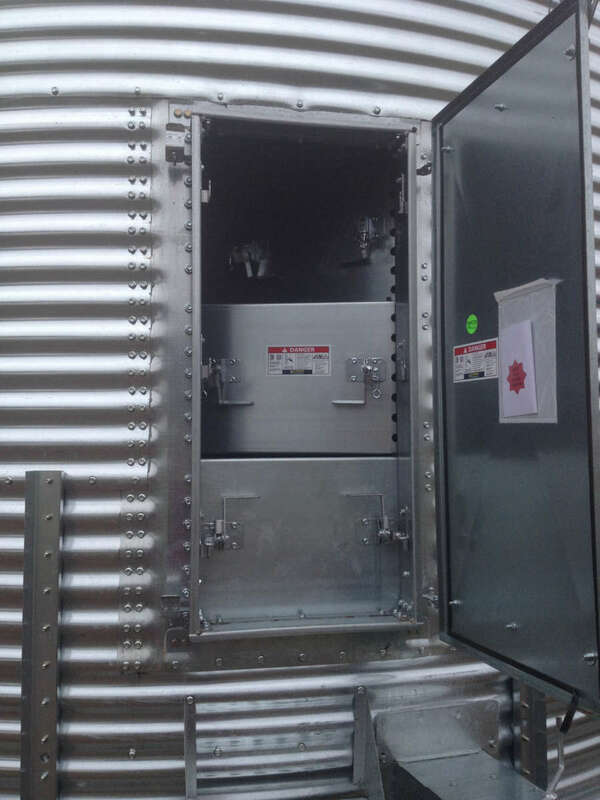 Many operations use air and heat, or they will use air and heat to dry their corn in one bin and then move it to another bin for storage. Our bin lets us put the corn in, dry it and store it in the same place. It may seem trivial, but the less you handle your corn…the better. On top of that, we don’t have to have all of the equipment one needs to dry corn with heat (etc). 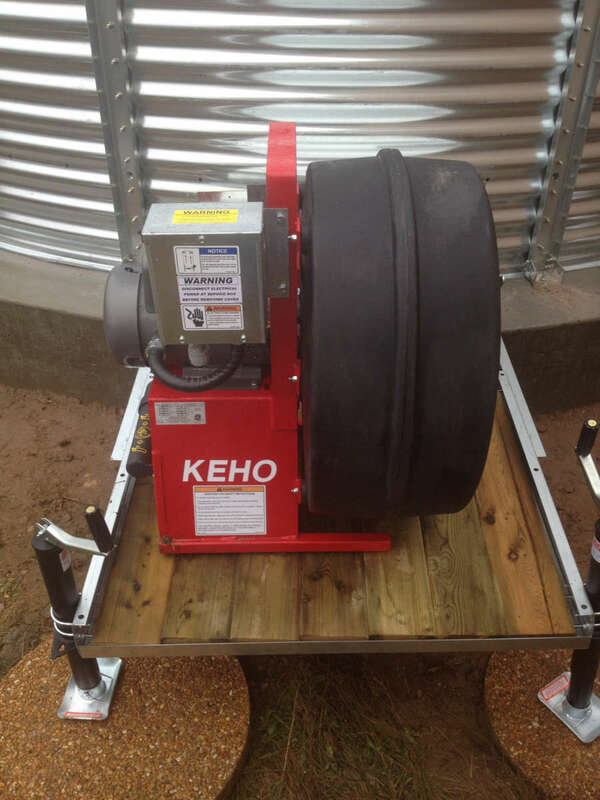 The Pressure Cure system has its doubters, but the way it works is by maximizing the amount of air you can push through the corn in a particular bin. Our bin has two 7.5HP fans to blow air, which is a lot of air movement for a smaller bin like ours. The fans are so strong that if you started them without any (or enough) corn in the bin, you can blow the floor off of its supports. Even when there is enough corn in there, any ‘fines’ or smaller particulates and the thin outer shells of corn kernels (aka “bee’s wings”) are blown up and out of the ten roof vents. The air creates a drying front that starts at the bottom and then moves steadily up through the corn. Once you place corn into any bin, it is a race to dry the corn at the very top before it starts to mold. For us, we don’t have a lot of corn or a large bin, so we should be able to dry our corn in a few days. When you talk to people with huge bins though, they can take a month or longer to dry their corn. That’s with the fans running 24/7. In the picture above, you see one of the two fans. The box with “Warning” on it houses the On/Off toggle, and it is a built in disconnect switch. The stand it is sitting on has two jacks on it that allow you to move the platform so that the fan is as close to perfectly level as possible. This is important because if your fan isn’t level it can really wear on its bearings over time and then you have a broken fan. Fans of any sort are pretty much automatically expensive, and these fans are no exception. 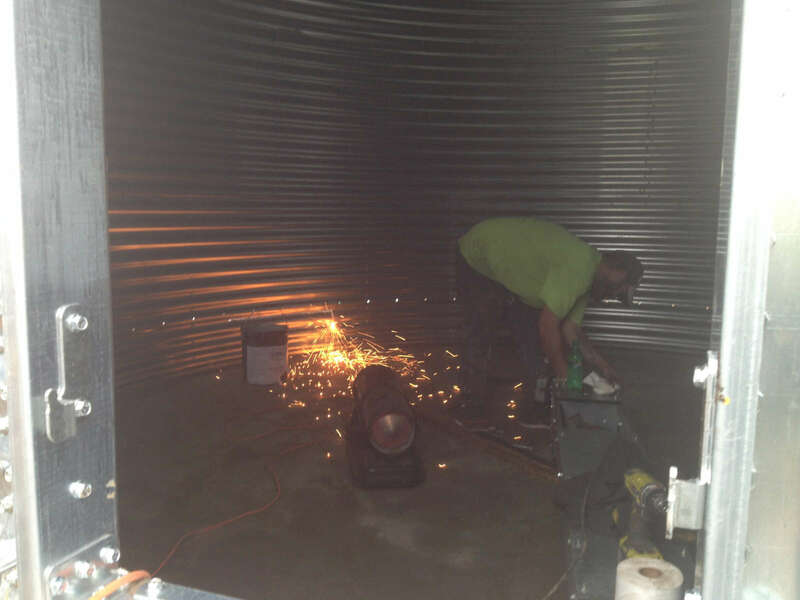 This is just a picture of the crew cutting holes into the bin so that the fans and their ductwork have an opening into the bin. This is all done below the drying floor, which looks like this. Can you see all of the little openings there? 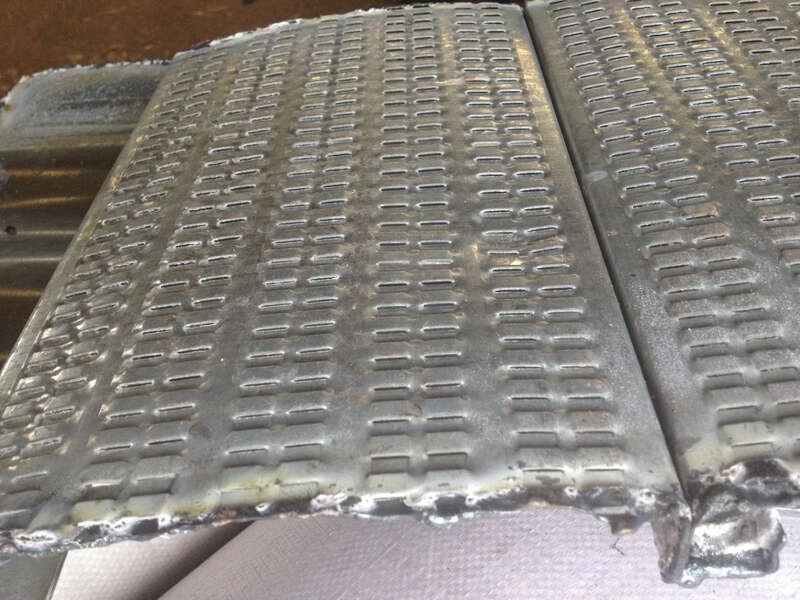 These allow all of the air to move through the floor and into the corn, and they also keep corn from falling through the floor. In fact, you can dry pretty much anything with this kind of drying floor. This piece was cut out to make room for one of the unload auger’s doors. The unload auger is part of a very important piece of the bin called a Power Sweep. Here’s what it looks like. The power sweep has an auger on top of the floor (the sweep) and an auger underneath the floor that moves the corn outside (you can see where the corn comes out in the very top photo, it’s sticking out just to the right of the door). There is a door in the center of the floor that opens up into the auger below the floor, and the auger on top of the floor slowly moves around the bin, moving corn into that door. Most of the corn is removed this way, but at the very end you open the other door and the corn on the sides is worked into that door and augered outside. It’s possible to get corn out of a bin without a power sweep, but it’s not advisable. This picture is showing how the bin is secured to the concrete pad. 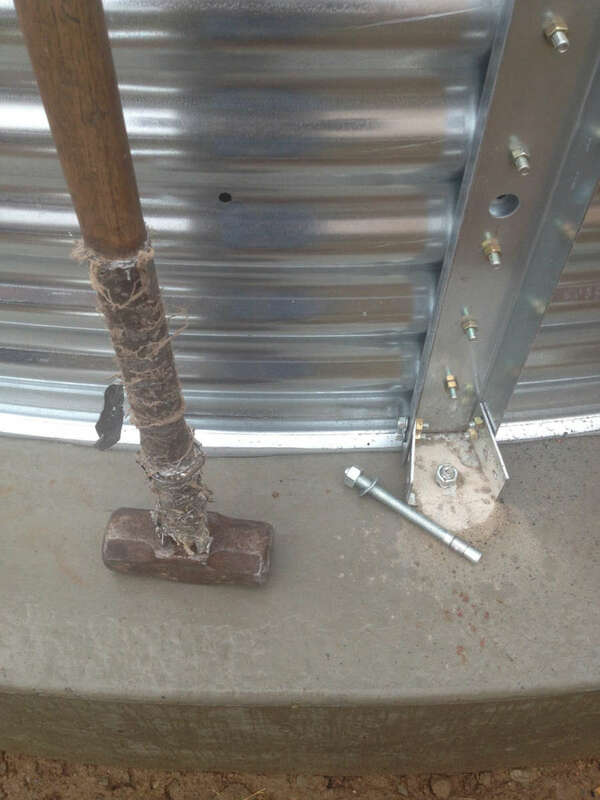 After holes are drilled into the concrete at numerous points around the bin, you insert that long bolt into the hold and sledge hammer it into the pad. That bolt is called a wedge bolt because the very bottom of it will expand inside the hole when you hit it with the hammer. 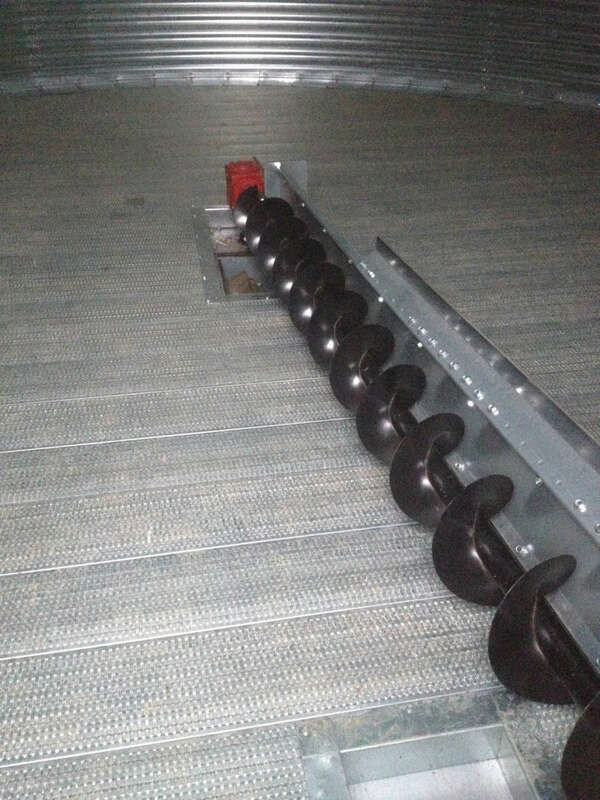 This makes a very secure anchor. Once it is in, you put a nut onto the bolt and tighten it down. Do it 20 more times and it’s anchored! Here’s the main door. You can see that behind the outer cover are three inner doors that each have their own securing system. These doors remind me of being on a ship or submarine in the Navy with how many bolts and tighteners are involved. Also note that the inner doors swing inward, so even if you were an idiot you couldn’t open those doors if there was corn behind them. If you were to stick your head inside this door and look up and to the left, you would see the inner ladder that allows one to climb down into the bin. There is a portal on the roof of the bin where you can climb up the outside ladder and then into the bin. Anyway, what am I forgetting? This bin has an opening in the very top of the roof for loading corn into the bin. Some bins have portals that allow you to load from the side of the roof, but that’s not ideal as you then have to spread the corn. We may have to do some spreading, but by center loading the corn it will pour in like sand in an hourglass. How do you get the corn up there? Another auger, but this one is nearly 60 feet long. 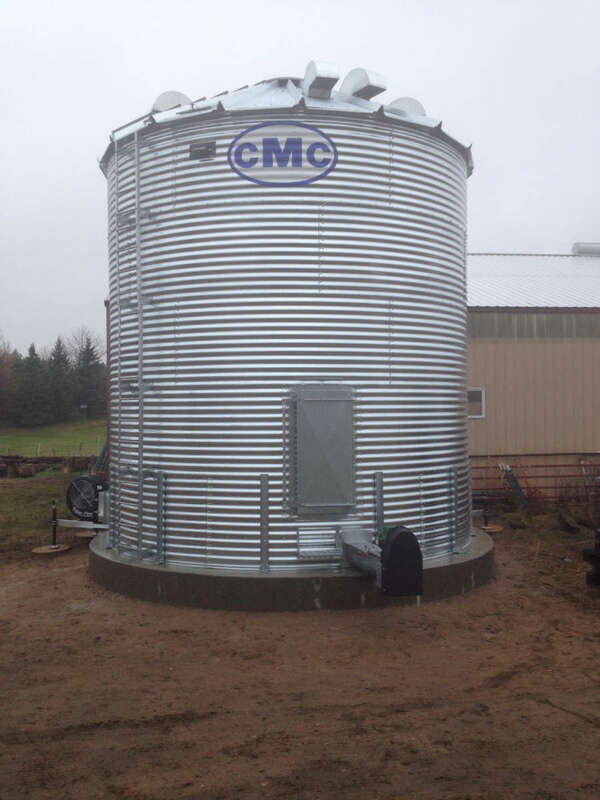 Our bin requires a minimum length of 45 feet so that the auger will reach the hole at the top of the bin. As corn is harvested by the combine, the combine holds the shelled corn in its own tank(s). When it is full, the combine swing an auger of its own out and over a gravity box and unloads the corn into that. It will likely take a couple of gravity boxes–so called because their contents are unloaded via gravity. You then take those gravity boxes over to the 60 foot auger that has been pre-positioned for unloading into the bin. The corn then slides out of the gravity boxes, into the auger’s ‘mouth’ and then augered up and into the bin. There are other methods one can follow, but this gives you the basic idea. This is just a quick post to let you know that we’ve sold out of our Thanksgiving turkeys for the year. We keep a cushion of 15-20 birds just in case Mother Nature sends some coyotes–or some other predator–our way like she did a couple of years ago, but they are also spoken for via our waiting list (which is also no longer available). So we are really, truly sold out. We will try to raise more next year, as the demand for our turkeys keeps going up year-to-year. If you are in Madison, you should be able to find some of our turkeys for sale at Underground Butcher, but I imagine they will also go fast now that most people are in full-on Thanksgiving mode. We also know the other farm(ers) offering turkeys there well (Ninepatch), and they have a wonderful farm located in North-Central Wisconsin. So, rest assured that you’ll be getting a quality bird through Underground regardless of which farm it was raised on. If the turkeys at Underground also sell out, or you’re not located in Madison and you’d like a quality bird for Thanksgiving, we can do our best to help you find another farm to get a turkey from. Next year, you can look for our sign-up lists at our farmers’ markets starting in August. Well, the goldenrod around here is already dead and releasing little puffballs of seed, but the corn is definitely turning brown and apple trees are still hunched over with the weight of their fruit. I actually love this season–as well as the one that follows–but farming in the fall tends to get a lot more complicated. At least, it does for us. How so? Well to give you one example of many, there’s that whole ‘birds need to drink water’ thing. You see, the effects of Fall are a little accentuated this year since we’ve still got nearly 2,500 birds out on pasture, but even if we had fewer birds we’d still have to be getting water to them. 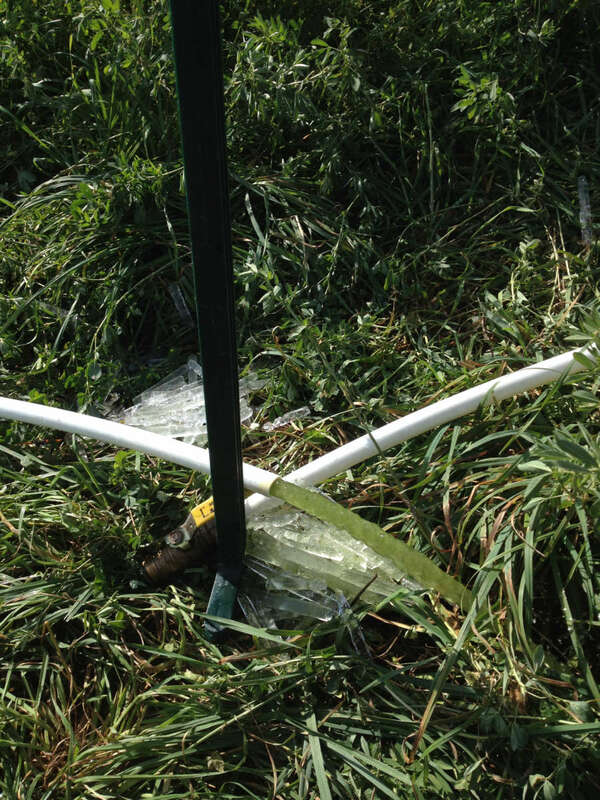 Normally, we just run our pex tubing (hose) out to the birds and let the automatic system do its thing. We can’t do that as easily now though because we’re well below freezing every night. So, before it gets too cold each evening, one of us has to walk out to pasture and disconnect the pex tubing in several different places so that it drains. There’s one very low spot too, so once you’ve disconnected the lines, you need to lift the low area(s) up and drain the water out of one end or the other. The other night, I neglected to do that and ended up having to wait until well past noon for water to flow freely. That mistake ended up looking like the picture below…once the ice had melted enough and the water pressure could push its way through. There are other downsides to this near-favorite season of mine. Rain, for instance, is far more problematic these days. I love the rain, my home is the great Pacific Northwest, but now when it falls it lingers far too long. Then you get a week of rain, and while the aquifers are slowly filling underground (one would hope), the pasture becomes a muddy mess that makes simple things like feeding animals a lot more, um, slippery. Another factor at play is that most of the pasture is now dormant, so there’s no real re-growth of alfalfa or grasses. That’s ok because we give them a very large area, but at the same time the pasture looks pretty brown in comparison to just a month or so ago. Here you can see the turkeys, ducks and chickens hanging out together. Some birds also end up getting soaked because they opt to stay out on pasture during a storm rather than under the shelter. This isn’t normally a problem, but then the temperature drops down to 24F at night and the poor decisions those birds made are highlighted in the most dramatic fashion possible. We can help out here by moving their feed underneath the shelters, but it’s no guarantee. 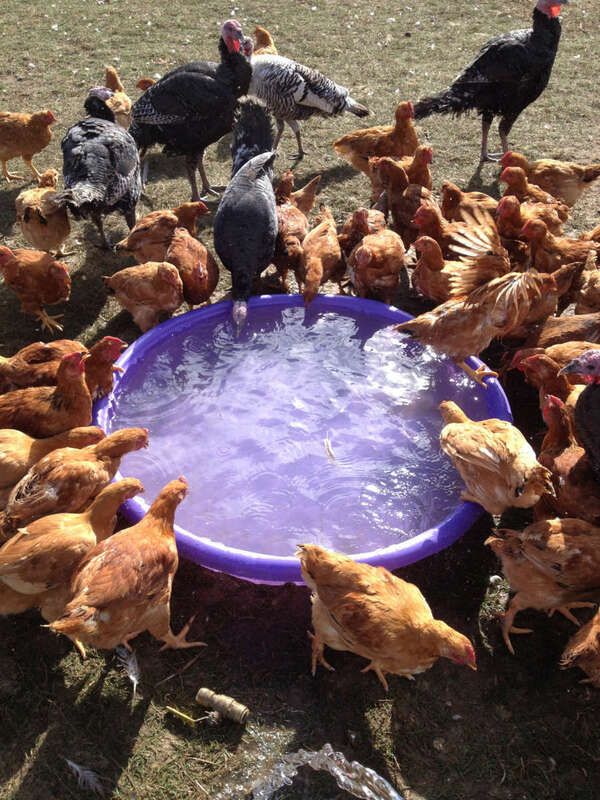 There will still be birds who opt for the cold soak. Granted, pretty soon you notice that everyone is under the shelter when it rains. I still don’t know if it’s because they’ve learned a lesson, if they’re just lingering around the feed, or if all of the bad decision makers are simply gone now. Don’t get me wrong here, I’m not trying to complain so much as explain how this season affects the day-to-day on the farm. It can be very frustrating, but one needs to get used to that in a hurry if he or she wants to farm because this is a career track that you ultimately have very little control over. You do what you can–and you do a lot–but Ma Nature has a funny way of occasionally making your well thought out plan look like a fool’s errand. You do have your victories though, and when times get harder it tends to make the animals a bit less wary of you. So they get closer, run up to you a bit more because they know you’ve got food, water, or a shelter fix, you know…basic needs stuff. I also find myself being less sarcastic with the birds and more sympathetic. Here we are discussing the latest pasture drama at one of the seasonal water coolers. There is a great sense of urgency to get to the end of the season because, by now, we’re pretty tired. You can’t linger too long in the light at the end of that tunnel though because there is still much to do. Plus, every day reminds us of some sort of winter preparation that we’ve forgotten…a memory that was washed clean months ago by the Spring.